Sloths, unlike many animals, do not show obvious external signs of stress. Their natural response to fear or danger is to hold still, and as a result, it is difficult to tell when a sloth is scared or stressed. The animal may look perfectly happy to us – but the reality will probably be very different. This causes a lot of problems for sloths in urban areas as people often don’t understand the stress that they are causing for the animal. Tourists frequently encounter sloths that are low down or crawling across the ground between trees, and in excitement (or perhaps in an attempt to get the perfect selfie) they often crowd the animal, make a lot of noise and even reach out to touch the fur. In high tourist areas sloths are also commonly exhibited by the side of the road, with unsuspecting tourists being charged to take a photo with the animal. In reality, these sloths have been pulled from the trees, often the mother will be killed, and the baby used as a photo prop until it dies (or someone pays to rescue it). The sloth is then replaced in a vicious money-making cycle. At SloCo we are raising awareness of these issues by establishing permanent signage in high tourist areas to promote responsible “sloth tourism”, and to educate people on what they should do if they see a sloth being offered for holding or photo opportunities (call the authorities or a local rescue centre). 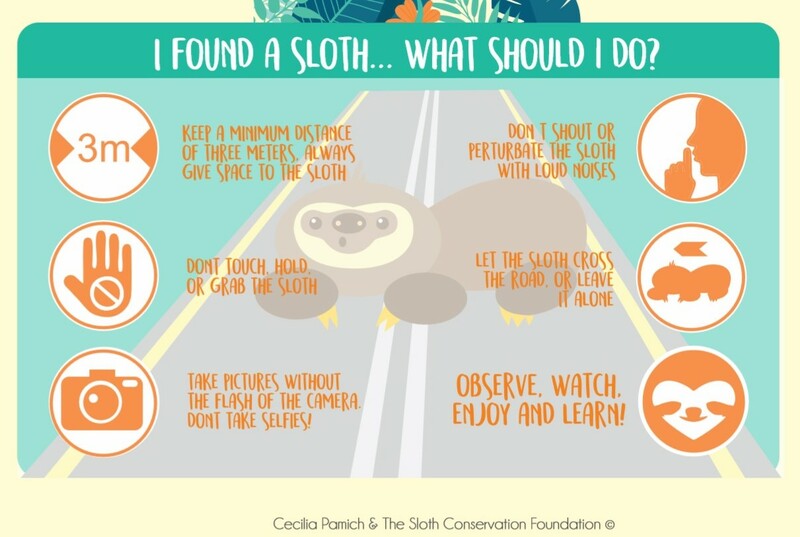 We also work with local hotels, businesses and restaurants, particularly those with sloths frequenting their property, and provide information leaflets to help educate guests about the problems that sloths are facing. On an international level, we are working to raise awareness of the harsh reality behind the sloth pet trade. Sloths that are sold as pets usually come from the wild. Even if the baby sloth was born in captivity, it is more than likely that the parents would have been taken from the wild several years earlier. Sloths are very slow to breed: the gestation period is 11 months, they only give birth to one baby at a time and this infant needs its mother’s milk for a long while after that. In the wild, baby sloths usually spend a full year with their mothers before reaching independence. This means that the sloths currently being held in captivity cannot physically produce enough babies to meet the ever-increasing demand from people wanting pet sloths. As a result, hundreds of sloths are removed from the wild every year and shipped to the US from countries such as Venezuela and Ecuador where export laws are slack. These individuals are then forced to breed, and the babies are sold into the pet trade at eye-watering prices. We use social media campaigns, blogs and our international school education materials to highlight the abusive nature of the sloth pet trade and to hopefully change the mindset of future generations.